I finished ANOTHER collab of a LIFETIME! LOL. We dedicate this wall TO ALL THE "Alice in Wonderland"||Pandora Hearts LOVERS out there. Well, the only thing I got to say is that this collab was FREAKING AWESOME! 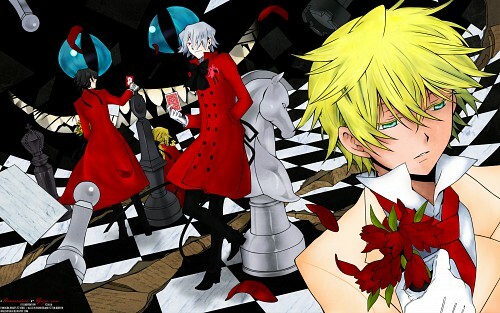 (@_@) The idea that Horseradish conceptualized----to mix Pandora hearts with Alice in Wonderland was brilliant because both have a lot of things in common----and the scan is perfect for what we're thinking. It took me about 8 hours I think to do the BG, and I've enjoyed doing the ripped floor and the tiles the most. And there's SO MANY FOLDERS! OMG, I almost got mad myself. XD So that's it, I loved doing this collab and I hope you guys like it! When I first saw the scan, I was like, (O__o) IT'S GORGEOUS! Though it's gonna be a tough one because it has a LOT of details in it. But that did stop me from completing this one. If you look closely on the original scan, their coats are black. Basically, the wall is B&W. The reason why made the coat of Oz white/cream (because he's the MAIN protagonist) and the others red was to show the movements of the shadows and such. Because if I colored it black, it would be just, well, BLACK. LOL. Other than that, I wanted it to associate the colors to the Red Queen. Well, I guess that's about it. (^3^) If I ever forget to mention something, I'll just update it as soon as I can. LOL. A comment. +FAVE, DL, comment+FAVE, comment+DL, FAVE+DL, and a comment+FAVE+DL would be most appreciated! C'mon, you know you want to FAVE it. LOL. Hope you guys will enjoy our collaboration! Love Chesha in the background, lol. beautiful colors! So bright! great Vector! And kudos to yago for filling in of course! Awesome! I love the colors and teh chessboard theme! I love the marbled floor and the Cheshire Cat! =^_^= Keep up the great work you two & Thanks for sharing! Like this, pretty art, pretty wall... all so pretty. lol Didn't get too far into this series, but with wallpapers like this to it, I always want to give it another shot. i wanna a red suit like this!